First... If you walk to the end of Beehive Lane in rural Crossville, Tennessee, you will find yourself standing in front of a peculiar mansion. 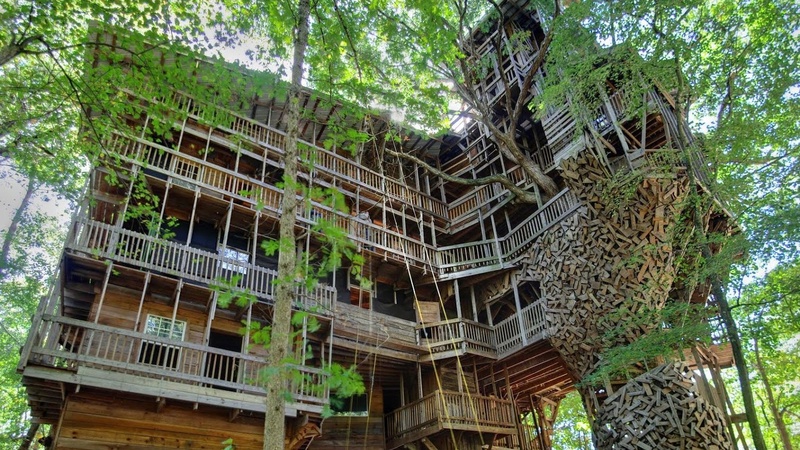 It's 15,500 square feet and eight stories high, and spans seven trees.It is the world's largest tree house. A man built it with recycled wood from old barns and construction sites, without a blueprints. There is graffiti everywhere, but it's sweet. People have simply written their names, or about love or about God. It was, for many years. one of Tennessee's top tourist attractions. But its owner never advertised and never charged admission. Instead he built it and offered it to the public as an act of faith. This is the story of Horace Burgess, the man who made the tree house, and the price he had to pay for it. Produced by Karen Duffin, supervising producer Nick White. Then... Samuel Feinstein was a man whose life revolved around reading books, analyzing them and writing his own works. But all that changed in an instant... and his world was plunged into confusion and pain. The only way for him to find meaning and purpose, was to create. He changed from reading books to building them. You can find information about Samuel Feinstein's bookbinding work here. Produced by Daniel A. Gross (@readwriteradio), supervising producer Bob Carlson. Music composed by Giuseppe Forte. This is a rebroadcast of an episode that originally aired May 6, 2014.